Al Baha City (BC) lies in the south-west of the kingdom of Saudi Arabia between Mecca and Aseer. It is the smallest of the kingdom's provinces (11,000 square km). It is surrounded by a number of cities, including Taif on the north, Beesha on the east, Abha on the south and the Red Sea coast city of Al Qunfuda on the west. This tourist city is situated in an area characterized by natural tree cover and agricultural plateaus. It consists of six towns, the most important of which are Beljarshy, Almandaq, and Almekhwah, in addition to the Baha city in the center of the province. The province comprises 31 administrative centers and has a population of 533,001. The province is known for its beauty and has forests, wildlife areas, valleys and mountains that attract visitors from all parts of the kingdom and the Persian Gulf area. Some of these areas are the forests of Raghdan, Ghomsan, Fayk, and Aljabal, and many other historical and archeological sites. It contains more than 53 forests. Al Baha is the homeland of the Ghamid and Zahran tribes and is divided geographically into three distinct parts: Sarah, which contains the high mountains characterized by temperate weather and rich plant cover due to relatively high annual rainfall, Tehama which is the lowland coastal area to the west of the Sarah characterized by very hot and humid weather and very little rainfall average, and the eastern hills characterized by an altitude of 1550 to 1900 meters above sea level with cool winters, hot summers and sparse plant cover. The largest city in the province, both in population and area, is Baljurashi (it was the first capital for the province), the second one is Almandaq. In Tehama, there are two major cities: Qilwah and Al-Mikhwah. The number of tribes are 18, branching from the main ones, Ghamid and Zahran. The province has 13 settled tribes (working in trades and agriculture) and 5 nomadic tribes. 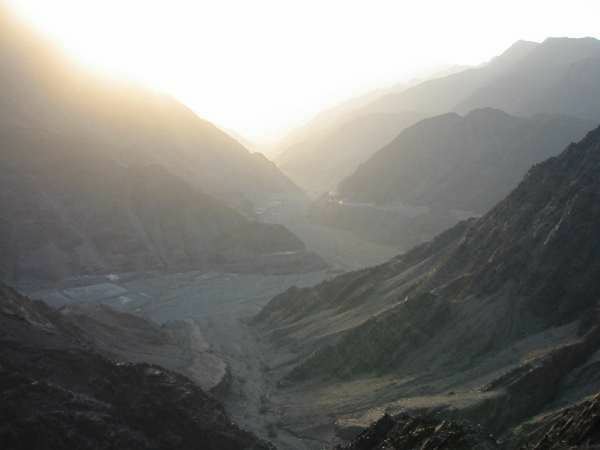 The climate in Al Baha is greatly affected by its varying geographic features. 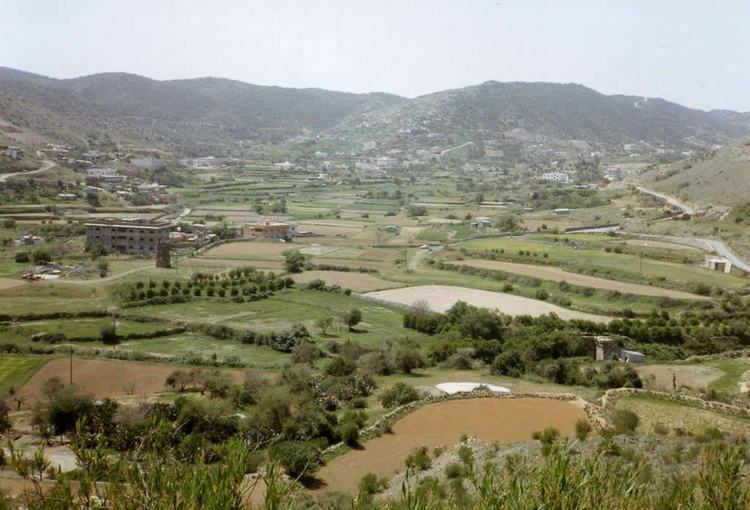 Generally speaking, the climate in Al-Baha is mild with temperatures ranging between 12 to 23 °C (53.6 to 73.4 °F). Due to its location at 2,500 metres (8,200 ft) above sea level, Al Baha's climate is moderate in summer and cold in winter. The area attracts visitors looking for a moderate climate and pristine, scenic views. In the Tehama area of the province, which is down on the coast, the climate is hot in the summer and warm in the winter. Humidity ranges from 52%–67%. While in the mountainous region, which is known as As-Sarah, the weather is cooler in summer and winter. Rainfall in the mountainous region lies in the range of 229 to 581 millimetres (9 to 23 in). The average throughout the whole region is 100 to 250 millimetres (3.9 to 9.8 in) annually. Post-World War 1, the village of El Zafir (قريه الظفير) had been the administrative centre of what was known then as Belad Ghamid, but with the establishment of Saudi Arabian government Ghamid and Zahran was administered as a unit in 1925, and the seat of local government transferred to Baljurashi ( بلجرشي ), a town situated fifteen miles south of el Zafir. The tribes of Al Baha Ghamid and Zahran are the indigenous people of Al Baha. Tribes in the region trace their origin to the famous pre-Islamic state of Sheba (مملكه سبأ) whose rule extended to areas presently known as Syria and Lebanon. Historians also report that they established the famous state of Axum, in Abyssinia. Prince Mishari bin Saud is the governor of the province since August 28, 2010. Al Baha is also known for their traditional towers, called in Arabic "qasaba". "Apparently unique to Asir architecture are the qasaba towers. Controversy surrounds their function—some argue that they were built as lookouts, and others that they were keeps, or even granaries. Perhaps it is a combination, although the right position of a watchtower, on a hill top, is the wrong place for a keep or granary." Dhee Ayn Village (Arabic: قرية ذي عين) is situated at about 24 km. southwest of al-Baha across 'Aqabat al-Baha, also known as Aqbat King Fahad. 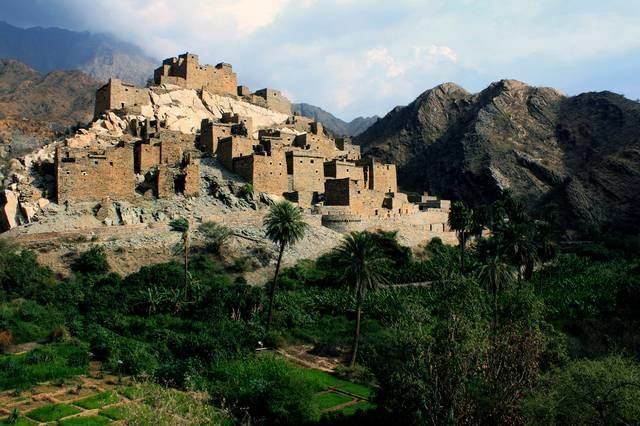 The famous village of Dhi Ain is sometimes known as "marble village" as it is built on a small marble mountain. The grove of palm trees is lush due to a small stream nearby. The villagers say that the marble village glows at sunset. 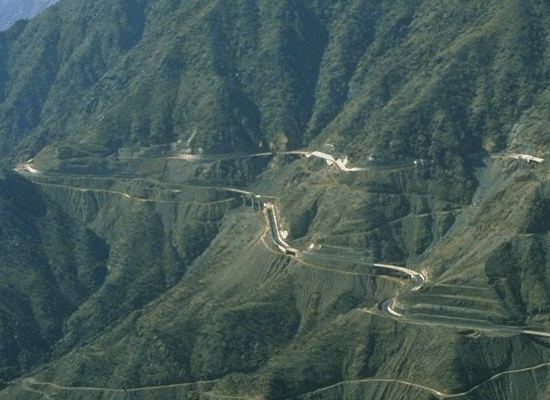 It also has a steep escarpment road, running into and out of tunnels on the way up and down. Dhi 'Ain was famous for its fruits and banana plantations which still grow there. The village dates back about 400 years, and it witnessed the battles between the Ottoman Turks and its inhabitants. "Even the road that leads to the (Dhee Ayn) village is impressive, and several historical stone and slate towers dot the way. Al-Bahah Region is known as the region of 1001 towers, once built to protect villages, roads and plantations from rivalling tribes. Today, these towers are abandoned, and many of them are partially or completely in ruins." "Al-Baha region is rich in ancient mining sites. The sites of Khayal al Masna' and al-Aqiq were major gold mining areas; while the village of Kuna, where over one hundred building structures are located date back to South Arabian Civilization." The souq or traditional market in Al Baha has been studied to see how the market performs in maintaining order and social customs. "Weekly markets in Al-Baha, which is located in the south-western part of Saudi Arabia, was not only performing economic functions, but also, social functions. Those markets continued to perform these functions until around 1975 when the modern markets began to take over, and other social institutions like schools, mail, and mass media began to do the social functions of those weekly markets. This study is trying to explain the social functions of weekly markets in Al-Baha like uniting the tribes, using the market as a tool of punishment, entertainment, mail and religious education." "Al-Baha National Airport receives flights from all cities of the Kingdom and is located in Aqiq Province 45km from Al-Baha city itself." * King Fahd Hospital (مستشفى الملك فهد) "Initially, the hospital has been operated by one of the International specialist companies in directing and operating hospitals, but since 1421 it was self operated under the supervision of MOH." The hospital is also a training hospital in the main health sciences, as stated in 2012: "King Fahad Hospital, Al-Baha is already accredited by the Saudi Commission for Health Specialties as training center for postgraduate programs of Saudi Board / Arab Board in the 4 main departments, namely: Pediatrics, General Surgery, Internal Medicine, and Obstetrics & Gynecology. These programs are completely accredited in the hospital and no need for the candidate to move into any other hospital for complete his training requirements. The Urology department is processing accreditation process that may be finalized by the next academic year." As a training hospital, the Medical Library, established in 1982, in the King Fahd Hospital is one of the largest libraries in the Province: "Health Sciences Library and Information Center represents the core of the Academic Affairs services provided for all health care workers in Al-Baha region. it is located on the ground floor of the main hospital building in front of the human resources department and Employee Health Clinic. The library contains 1,250 hard copies of recent medical textbooks in all medical fields with plenty of full color medical atlases, dictionaries, and other materials for learning the English language with a section for Arabic books and publications of interest for administrative staff. The digital library includes 800 digital books with audiovisual materials for teaching medical examination, heart and breath sounds and also materials for teaching the English language. This section includes digital version of video recordings for all scientific events carried out in the hospital. Also, digital archives are available for some of the most prestigious medical journals for the last few years." "The southern tribal hinterland of Baha—home to especially the Al-Ghamdi and Al-Zahrani tribes—has been renowned for centuries for their tribal cemeteries that are now slowly vanishing, according to Asharq Al-Awsat newspaper... One old villager explained how tribal cemeteries came about. “People used to die in large numbers and very rapidly one after the other because of diseases. So the villagers would dig graves close by burying members of the same family in one area. That was how the family and tribal burial grounds came about,” he said. The old man continued, “If the family ran out of space, they would open old graves where family members had been buried before and add more people to them. This process is known as khashf.” During famines and outbreaks of epidemics huge numbers of people would die and many tribes faced difficulties in digging new graves because of the difficult weather. Elderly people remember that in olden times, the winter used to stretch for more than six months and would be accompanied with lots of rain and fog making movement difficult. But due to tribal rivalries many families would guard their cemeteries and put restrictions on who got buried in them. Across Baha burial grounds are constructed in different ways. Some cemeteries consist of underground vaults or concrete burial chambers with the capacity of holding a large number of bodies at a time. Such vaults include windows for people to peer through and are usually decorated ornately with writings, drawings and patterns. Muhammad Saleh, a local resident, said, “One of the things that is so iconic about many of these graves is the fact that many of them are not directed toward the Kaaba. This tells us that some of these graves are from the pre-Islamic era. In Islam the face of a dead person should be toward the Kaaba.”"
The Community College belongs to Umm Al Qura University of Makkah. All of the Saudi citizens of Al Baha are Sunni Muslim, who in the past practiced Shafi`i, a school of fiqh that was dominant in Hejaz. The largest mosque in Al-Baha is King Fahad Mosque (Arabic: جامع الملك فهد ). The city is known for its healthy and nutritious traditional meals brought by local farming such as Dagabees (Arabic: دغابيس), Aseeda (Arabic : عصيده), Areeka (Arabic عريكه) and the Southern wheat bread with Butter oil (Arabic خبز البر بالسمن ). "The Province is famous for its production of honey, in addition to its agricultural production of vegetables, grain, fruit, and dates. The region also grows grapes, grapefruits, lemons, oranges, pomegranates and dates." It is claimed by some Arab authors that the dialect of Belad Ghamid and Zahran (Now known as Al Baha province in Saudi Arabia) is nearest to classical Arabic. Ahmed Abdul Ghafur Attar (Arabic : احمد عبدالغفور عطار ) has said in an article* that the language of the Hejaz (Arabic لهجات الحجاز), especially that which is spoken in Belad Ghamdi and Zahran is close to the Classical Language. Faisal Ghori (Arabic فيصل غوري), a famous scholar of Arabic Literature wrote in his book Qabayil Al- Hejaz (Arabic قبائل الحجاز) The Quranic Arabic upon which our grammar is based on does not exist in any tribe. The only thing we can say is that there are some tribes whose language is much closer to classical language . The tribes of Belad Ghamid and Zahran are a good example of this . The Al Baha literary club is concerned with intellectual meetings, poems, novels and book distribution. It hosts intellectuals from all regions of Saudi Arabia. Founded in 2009, their website can be accessed at http://www.adbialbaha.com/index.php. King Saud Sport City complex (Arabic: مدينة الملك سعود الرياضية) provides sport and leisure facilities including swimming pools, a football club, basketball. Visitors from inside the kingdom and nearby countries are particularly attracted to the area by its more than 53 forests, which include the Raghdan forest, which covers an area of 600,000 square meters just five kilometers from Al Baha city. Iit has been provided with children's playgrounds and other amenities. The Amdan forest is 55 kilometers to the north of Al Baha. It abounds in olive trees, Ara'r shrubs and other natural vegetation. The Wadi Feig forest is 8 kilometers from Al Baha. It is encircled by a green valley littered with apricot, pomegranate and grape orchards. The Wadi Al Ageeg forest is 40 kilometers from Al Baha and abounds in various fruit trees and tall lotus trees. Al Baha airport is in Ageeg city. 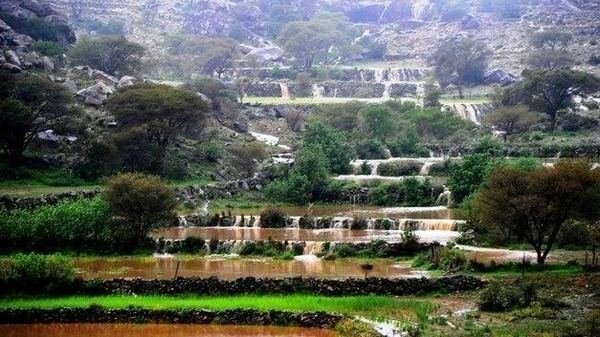 The Al Kharrara waterfall is 30 kilometers to the south of Al Baha. Its scenic view attracts a large numbers of visitors. Shada Mountain (Arabic: جبال شدا ) is the highest summit in Makhwah It features rare rocky formations that attract amateur climbers of various levels . the Arabian leopard is known to exist near the Shada mountain. The festival takes place every summer and holds a number of activities and sports events, as well as a number of cultural, literary and religious programs. Equestrian and Olympic marathon activities will be held as well as air shows. Prizes are given during this festival such as cars and flight tickets in addition to daily draws and cash and gifts. Al Baha province is well known for its production of high quality honey. Al Baha farmers have organized the third International Honey Festival in 2010 . The festival hosted 10 Arab states production of honey in addition to local produced honey. Al Baha is served by four major Arabic-language newspapers, Asharq_Al_Awsat, Al Watan, Okaz, and Al Bilad, as well as two major English-language newspapers, Saudi_Gazette and Arab_News. 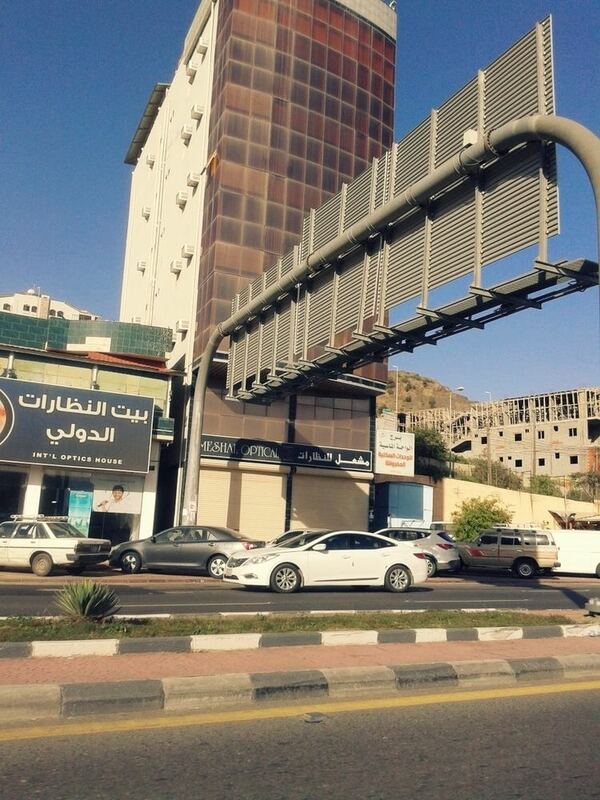 Okaz and Al Watan are the primary newspapers of Al Baha and some other Saudi cities. With over a million readers; they focus mainly on issues that affect the city. Al Baha Today (e-version Newspaper) is a daily electronic newspaper directed at locals, new residents, incoming visitors, tourists, and the developing tourism business sector. The magazine serves as a guide to the city's sights and attractions, restaurants, shopping and entertainment. It can be accessed via http://albahatoday.cc. Television stations serving the city area include Saudi TV1, Saudi TV2, Saudi TV Sports, Al Ekhbariya, the ART channels network and hundreds of cable, satellite and other specialty television providers. St_John_Philby (also known as Sheikh Abdullah by King Abdulaziz) documented his journey crossing from Riyadh to Jeddah by the "backdoor" route, writing on the Al Baha district of Arabia in his famous book The Arabian Highlands . Later he was awarded the Royal Geographical Society Founders Gold Medal for his written desert journey.